Acknowledge the significant and profound impacts climate change has on the health of people and our health system. Ensure the Strategy includes a credible, equitable and stable plan to rapidly reduce greenhouse gas emissions, with emphasis on a rapid transition to renewable energy in the electricity and transport sectors. Support rapid phase out of fossil fuel subsidies which contribute to climate change and health impacts. Support the implementation of a plan to assist the health sector and the community, particularly people at risk, to adapt and build resilience to unavoidable climate change impacts already locked in. Support a climate and health research program to evaluate specific threats to health in Australia from climate change and fossil fuels. 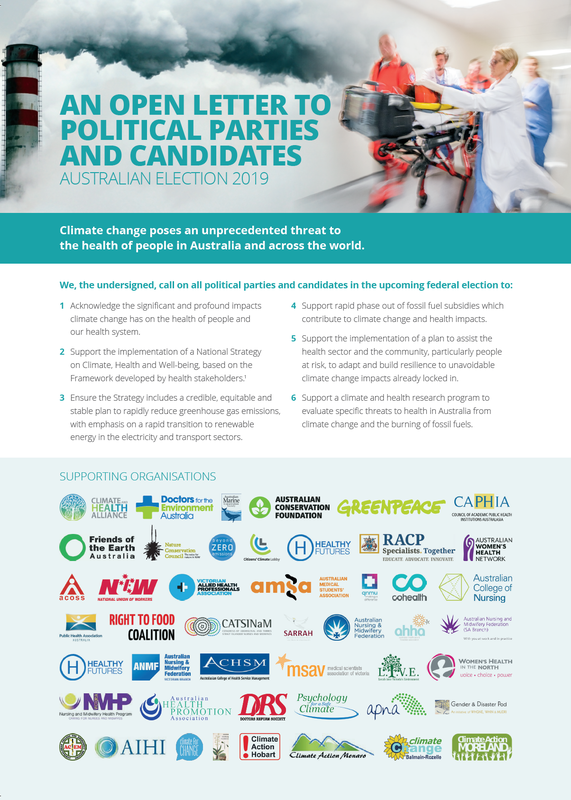 We are a group of organisations and individuals in the health, social and environment sectors calling on all parties and candidates to publicly recognise the significant and profound health impacts of climate change to Australian people. We need to urgently act to rapidly reduce greenhouse gas emissions and put in place a plan to adapt and build resilience to unavoidable climate change impacts from warming that has already occurred. of its national climate change response. But the response from successive governments to date has been woefully inadequate, and Australian people’s health and lives are at risk. by several decades of national and global scientific evidence, and the direct experience of hundreds of thousands of people experiencing the health impacts of climate change every day, and hundreds of thousands of deaths that have already occurred. The recent Intergovernmental Panel on Climate Change (IPCC) Global Warming of 1.5 Degrees report provides incontrovertible evidence that the “climate-related risks to health, livelihoods, food security, water supply, human security, and economic growth are projected to increase with global warming of 1.5°C and increase further with 2°C”. 1. Present day changes in heat waves, labour capacity, vector-borne disease, and food security provide early warning of the compounded and overwhelming impacts on public health that are expected if temperatures continue to rise. Trends in climate change impacts, exposures, and vulnerabilities show an unacceptably high level of risk for the current and future health of populations across the world. 3. Despite these delays, a number of sectors have seen the beginning of a low-carbon transition, and it is clear that the nature and scale of the response to climate change will be the determining factor in shaping the health of nations for centuries to come. 4. Ensuring a widespread understanding of climate change as a central public health issue will be crucial in delivering an accelerated response, with the health profession beginning to rise to this challenge. Health services in Australia are already experiencing the destructive effects of climate change, which is damaging vital health infrastructure, impacting the health workforce, and putting at risk the ability of some services to continue to provide care for the community. 8 These threats will only amplify in the future, putting more lives at risk. These risks and consequences cannot be managed through the existing health system. 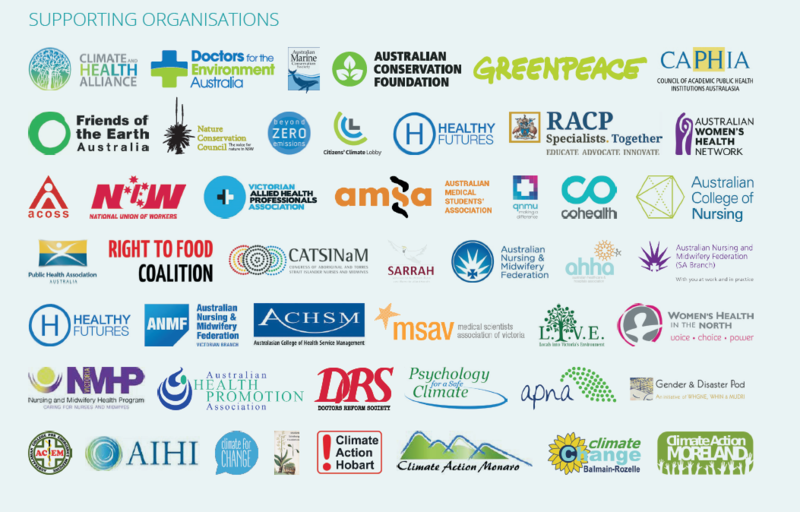 The organisations listed here support a Framework for a National Strategy on Climate, Health and Well-being to guide this work. We acknowledge the Australian Labor Party’s commitment to implement a National Climate, Health and Well-being Plan based on this Framework if elected to govern, 10 and the support of The Greens. We call upon the Coalition to make a similar commitment. We stand ready to assist the next Australian Government to further develop and implement comprehensive policy to avoid further loss of life, injury and illness that will inevitably result if there is any further delay. Entry filed under: climate change info, health, news, Vote Climate. Tags: ausvotes, ausvotes2019, CAHA, climateelection, health, open letter.